Kamaishi was utterly devastated in the 2011 tsunami, losing some 1250 souls (the population stands at around 34000 today) along with most of the local economy. They’ve been rebuilding since, but like the rest of the Tohoku region there’s been further population loss as significant numbers of young people moved away to find new work; meanwhile many of those who stayed have been in temporary housing since. 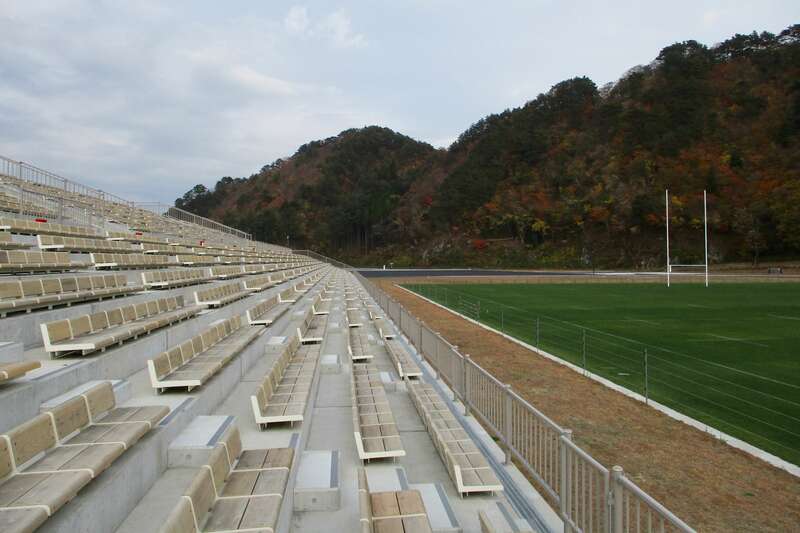 The Kamaishi Recovery Memorial Stadium was conceived to boost the local economy, somewhat controversially due to the housing situation, but construction went ahead and the stadium was completed in 2018 (and the government has promised that all those still in temporary housing will be in their new homes before the World Cup). It’s a small stadium with 6000 permanent seats, plus temporary stands expanding it to 16000 for the World Cup, and it’s only hosting two pool matches (Fiji vs Uruguay & Namibia vs Canada). 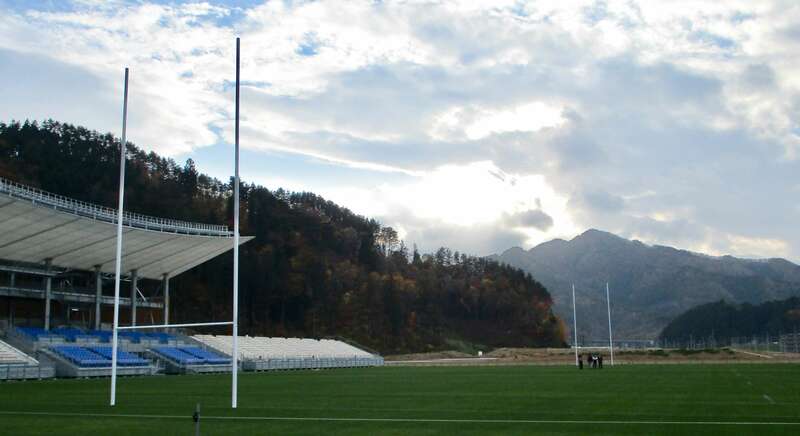 But Kamaishi is legit rugby territory – it’s the main local sport and the former local Nippon Steel rugby team won seven back-to-back titles in the 70s/80s (the modern team, the Seawaves, plays in the 2nd tier) – and having the world come to Kamaishi to watch rugby means a lot for both this small town and the wider Tohoku region it’s a part of. The stadium’s a short walk from Unosumai Station, two stops north of Kamaishi Station on the coastal Sanriku Line. This line was severely damaged in the 2011 tsunami, with this section north from Kamaishi the last to be repaired; it’s scheduled to be back in service in early 2019, in good time for the World Cup. Kamaishi is at the end of the Yamada Line from Hanamaki (90km inland), taking 2 hours by local train or 100 minutes on the Hamayuri limited express; the Hamayuri originates from Morioka (the region’s main city), from where it’s 2h15 to Kamaishi. If you’re attending the Namibia vs Canada match and travelling to Kamaishi on the day, kick off’s at 12.15 so you need to be on the Hamayuri leaving Morioka at 8.39, Hanamaki at 9.06, or Shin-Hanamaki at 9.19. 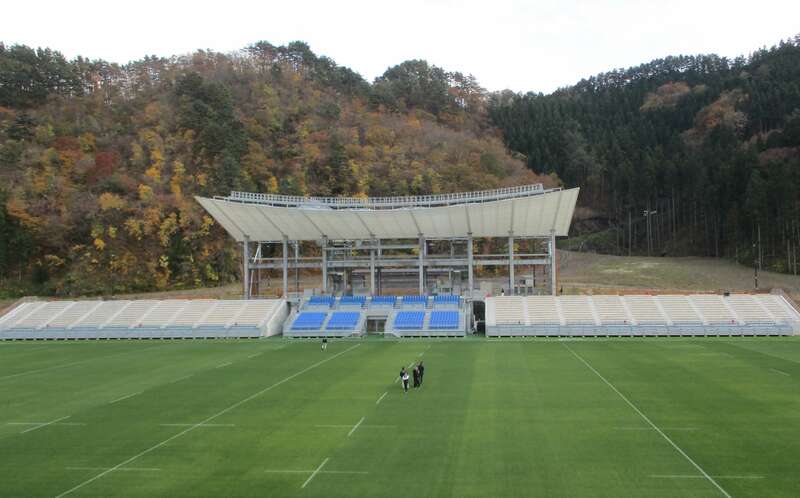 The Fiji v Uruguay match kicks off at 14.15 so you can also take the Yamada Line local service at 9.56 from Hanamaki (which you can connect to from Morioka on the JR Tohoku Line leaving at 8.58) or 10.09 from Shin-Hanamaki (which you can connect to from Morioka on the shinkansen leaving Morioka at 9.07). If this sounds confusing you can easily check all these journey times on Hyperdia; see here for an explanation on how to use it. If you’re thinking of travelling up from Tokyo (or other points inbetween) on the day, it’s possible by taking the shinkansen and changing at Shin-Hanamaki but from Tokyo Station you’d be looking at a 5-hour journey and a 6am start; even from Sendai it’s still a 3-hour journey. It’s also possible to get to Unosumai Station from the other direction by travelling southwards along the Sanriku Line from the north, but this is slower e.g. from Morioka it’s 2 hours to Miyako where you’d change to the Sanriku Line, then another hour to Unosumai from there. Actually staying in Miyako could be a decent option though. Apart from the Sanriku Line these trains are all covered by the JR Pass; you need cash for the Sanriku Line (and JR Lines if you don’t have the JR Pass) as IC cards are not accepted in this area. Options are limited in Kamaishi itself; see here to search and book a few of them on Agoda. Additionally there’s a couple more which aren’t listed with the OTAs: Hotel Marue (English website here), and Kamaishi Station Hotel (Japanese-only website here). Both of these are near Kamaishi Station, and both only accept reservations over the phone at present – and verbal communication may be difficult. Hotel Marue has on online booking page under construction (this one), so once that’s up & running you should be able to have a go at booking online. The above Agoda link for Kamaishi will also show the options in Ofunato, a small town about an hour south of Kamaishi on the Sanriku Line. There aren’t any listings in Kamaishi, but Airbnb could be a good option for basing yourself in Morioka or Sendai. 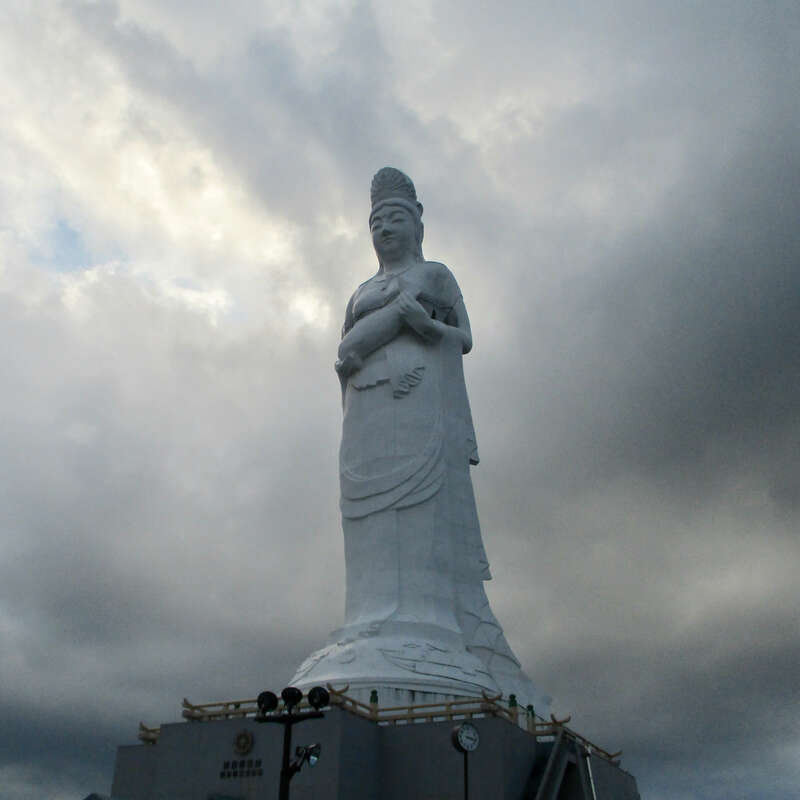 The Kamaishi Dai-Kannon is a large statue of the Buddhist goddess of mercy which stands looking out to sea on the edge of town. You can climb the spiral stairs inside the statue to the viewing deck in her arms, and there’s also a portion of the Buddha’s ashes housed in the attached temple complex. It’s a 10-minute taxi ride to the Dai-Kannon from Kamaishi Station. The Iron & Steel Museum (10 minutes on foot from the Dai-Kannon) gives the history of Kamaishi as Japan’s first metalworks town during the country’s modernisation. 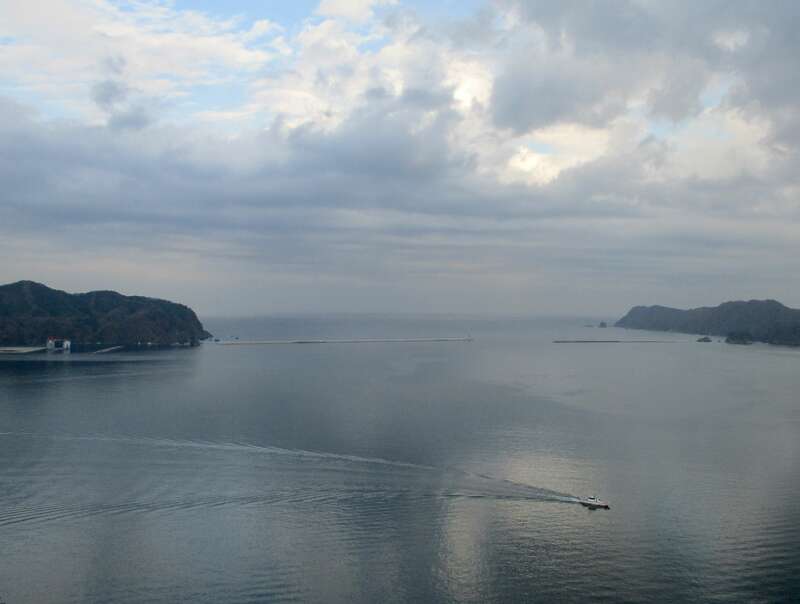 The Sanriku Coast: the entire coastline is made up of beautiful cliffs, bays, and beaches, but two particularly noteworthy spots near(ish) Kamaishi are Jodogahama Beach in Miyako, and the Kitayamazaki Coast north of Miyako. It’s an hour by train from Kamaishi to Miyako, and 20 minutes by bus (or taxi) from there to Jodogahama (see here for Jodogahama info & pics, Japanese only). To reach Kitayamazaki continue another 40 minutes on the train beyond Miyako to Shimanokoshi or 45 minutes to Tanohata; from Shimanokoshi it’s a 10-minute walk to the boat pier for sightseeing cruises, or from Tanohata it’s a 20-minute taxi ride to the Kitayamazaki Observatory. See here (Japanese only) for more on Kitayamazaki. Any questions about watching the rugby in Kamaishi? Give me a shout below and I’ll get back to you.